The android hardware and system information is different from device to device. 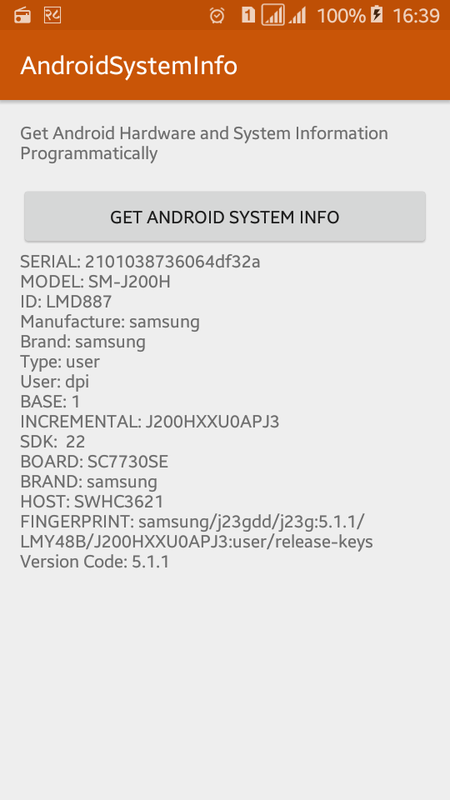 You can find your android device info manually in About device section of settings. In this tutorial, you will learn to get android device system and hardware information programmatically. We will focus on some of the properties like serial number, model no, id, android SDK, brand, manufacture, version code, etc. There are many other info you can get from a android device but here we will focus on some of the android properties. To get system info, we are going to add a button and a textview to display information of android device when button is clicked. Create a new android project with project name AndroidSystemInfo packagecom.viralandroid.androidsysteminfo. Open your activity_main.xml file and add a Button and TextView with different id. TextView is used to display device info when we click the button. Following is the complete code XML layout file. Open your MainActivity.java activity file and define button and textview that we have created above in xml layout file. To get and display system info, see the following code. You have done all things. Now, run your application by clicking run button and click Get Android System Info button; you will see all information below the button like the screenshot presented above.